Threads like this are frustrating. I simply do not have the fluidity necessary to keep up with all of the kits, let alone play catch up! Man, that is an absolute piece of art! Really, it's a sculpture as much as a kit! With that kind of beauty, it's darn near impossible to not empty your wallet. Last edited by lakespeed on Fri Aug 02, 2013 1:04 am, edited 1 time in total. 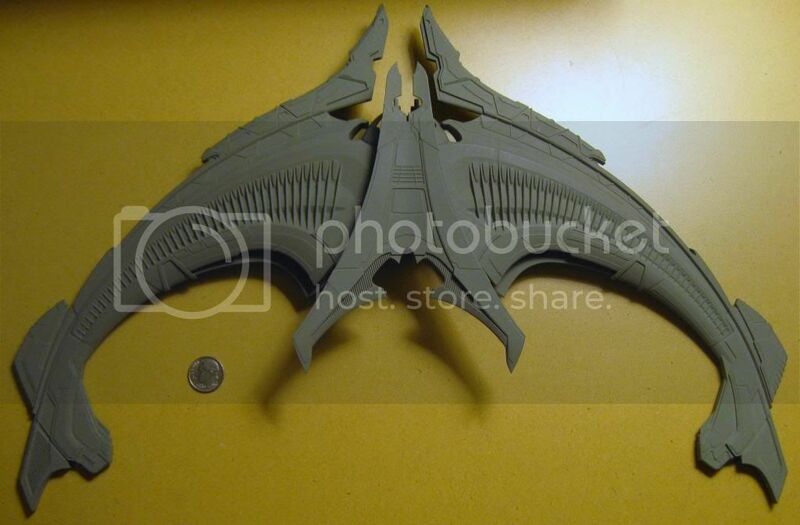 lakespeed wrote: If it makes you happy it will be cheaper than the Jem'Hadar Cruiser. Pricing for this should be $110. Oh yeah I'm liking the look of this one...very cool....I'm really drawn more to the alien ships in ST for some reason...count me in. I drooled on the parts at WonderFest. It's not a design that I'm familiar with (missed a lot of the DS9 episodes due to moving/no cable or satellite TV), but it's definitely one that's growing on me. Any idea on a release date? Gotta save up some cash. Rich, it's actually from ST:Insurrection, not DS9. Last edited by lakespeed on Fri Aug 02, 2013 1:23 am, edited 1 time in total.